Big River Man on Planet Green. Watch it. "People don't realize that the Amazon is the last frontier on earth. It is still 80% unexplored. There are rivers that go for 1,000 km that are totally uninhabited." "At the current rate half the Amazon will be cattle farms by the year 2030." -Borut Strel's voiceover, Martin's son, Big River Man. Martin Strel and Big River Man. "A film like no other, Big River Man is the true story of Martin Strel, the World record-holding endurance swimmer, and his insane attempt to be the first person to swim the world's most dangerous river, the mighty Amazon. Always looking for challenges of the impossible, Strel completed his epic Amazon river swim in April, 2007, making it all the way from Atalaya, Peru, to the Atlantic Ocean at Belém, Brazil. He was struggling the river for 66 days, for more than 10 hours a day and swam a total of 3274 miles. He became a worldwide hero, and the focus of this great film with an important green message." - Planet Green. Martin's Green Message. The most significant part of this movie is in regards to Martin's selfless and many times insane commitment to his swimming feats. His motivation is nature, and his deep connection to it. He hopes that his headline-catching swims will help send a message to the world about keeping our waters pure and safe from the pollution of man. Martin is deeply inspired by animals and nature. Almost to an unhealthy extent. Martin was severely beaten as a child and attributes his abusive childhood to his outstanding will to tolerate pain and endurance when he swims. In the film, it seemed Martin was most alive, well and calm when he was immersed in the Amazon river - just like one of the many species that call the Amazon home. "One single mahogany tree in the Amazon can be worth up to $20,000 in Europe or America." "These mahogany trees are made into expensive boats and furniture, but mostly musical instruments, especially electric guitars." "As of 2006 20% of the Amazon forest has been cut down, at the current rate of cutting, half the forest will be gone in 20 years." "An area of jungle the size of a small country disappears each year, most of this is due to cattle ranching. Each year the sky turns black with smoke for months as pristine forest is burned to make way new cow fields." "Countless species of animals and plants become extinct each burn season, this is all simply because of the world's demand to eat beef." "Even though the UN released a report saying that cattle production has more harmful an environmental impact than all the cars on the planet, the fast food companies are spending millions to promote even more consumption and bigger burgers." "At the current rate half the Amazon will be cattle farms by the year 2030, and by the end of century, not only Amazon, but all of he world's rain forests will need to be cut down to accommodate the needs of a world with 14 billion people." I highly suggest you check out this film. It is entertaining, inspiring, heart-wrenching and informative. "An estimated 200 million pounds of beef are imported from Central America every year and this requires land for cattle grazing which, in turn, requires rain forest clear-cutting. Every minute of every day, we lose the equivalent of a football field of rain forest to make room for doomed cattle. That's 55 square feet of forest per hamburger. "-Planet Green, Green Glossary. More on this problem from Planet Green. 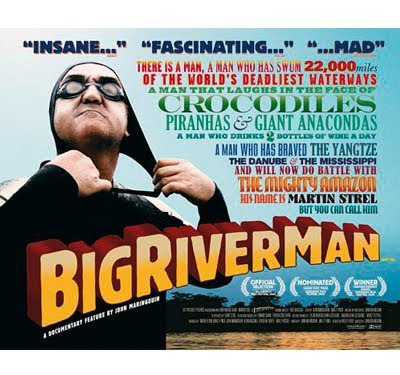 Check Planet Green's TV listings to find out when Big River Man is playing.